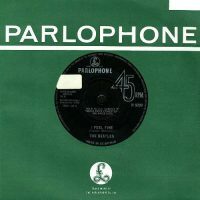 I Feel Fine, The Beatles' eighth Parlophone single was a standalone release not intended for their forthcoming album Beatles For Sale. Its catalogue number was Parlophone R 5200, and the b-side was She's A Woman. The single entered the UK singles chart on 3 December, and from 10 December spent five weeks at number one. In all it spent 13 weeks in the chart.